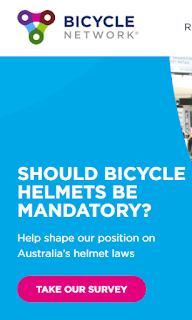 Bicycle Network, Australia's largest cycling organization, has recently begun questioning their support of their country's mandatory helmet law. Help them work through this admirable process by taking their survey. You do not have to be a resident of Australia to participate. Also on that page you will find a means for uploading academic papers to support your postion. Please take a few minutes to add your voice and perspective.